When talking about great places to travel, there are some which seem to get overshadowed. Sometimes it's nice to think outside the box, and go to a new area. One of the best places to go is Shanghai in China. Not only does Shanghai have a past that goes back almost five thousand years, it's also one of the most modern cities of today. People travel from all over the world to see this city and what it has become. The city of Shanghai is pretty much divided in half by the Huangpu River. On the west side of that river you are going to find a lot of ancient buildings and temples. You are also going to find a lot of other things that seem to be grand tourist spots. Since a lot of travellers come to this area of Shanghai, it's pretty common to see a lot of luxury hotels there as well. On the east side of the river, although not as much of a tourist spot, you can see a glimpse of what the future has in store for Shanghai. This area seems to be the financial district of Shanghai and the main catalyst for why the city keeps on growing. 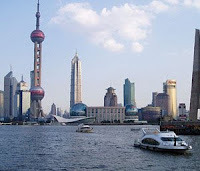 There are tons of landmarks that you have to see when in Shanghai. The first one is the Jin Mao Tower. This pretty much translates into the Golden Prosperity. This tower stands 420.5 meters in the sky and has over 88 stories that the public can visit. Floors 89 - 93 are floors that are not allowed to have visitors.